The Mrs. Yoy Blog: Three Strikes and You're Out! Another title for this blog entry could have been the religious trifecta. You are about to find out why. As you know from reading the hundreds of Mrs. Yoy blog entries, we are a Jewish family. We are not religious zealots, but we observe our holidays and appreciate our rich culture and history. Living in Atlanta is not like living in South Florida or New York. While there is a substantial Jewish population here, it is not as prominent as it is in other areas of the country. I know this. I've lived here going on twelve years. I've experienced a variety of awkward or funny things that people have said to me since I've become a Southerner. But over the past few days there has been a spike in activity, due to the upcoming holidays this weekend. Yesterday I came home and had a pamphlet about Jesus saving me stuck in my front door. It was from the Witnesses. They canvass our neighborhood A LOT. I quickly called my neighbor to see if she also received one. The last time the Witnesses came by, they pointed to the mezzuzah hanging on my doorpost and wanted to have a conversation about being Jewish. They even offered to come back with some pamphlets. I politely declined. My neighbor confirmed she had also received the pamphlet. Whew, I was not being singled out. Today I ran to Publix, and even though I swore I wouldn't let it happen again, this lady checked me out. As she scanned my Gefilte fish (barf) and jelly fruit slices she inched toward the topic. MRS. YOY: We are Jewish. You can say it out loud. It's not a dirty word. PUBLIX CHECKER: So you don't celebrate? MRS. YOY: No, we celebrate a different holiday. PUBLIX CHECKER: And it's called....? MRS. YOY: Passover. It begins tomorrow at sundown. PUBLIX CHECKER: So it's like Good Friday? MRS. YOY: ____________________ Because I literally have no words. I leave Publix feeling a little weird. It's not like I'm a unicorn. There are lots of Jews floating around Atlanta. How can I seem to be such a novelty to this woman? On a side note, why does Publix have included in their Passover display Yarhzeit candles and not kosher for Passover noodles? Discuss. Fast forward a few hours. We are home from the boys' school seder, which was a massive failure. We had to leave early, as usual. Little E is napping. Big E and I are testing out new paint colors in his bedroom. Ninja quick, I grab Poodle Yoy and muzzled her yappy mouth and make my way downstairs. My neighborhood strategy is this, while I hate answering my door because there is a chance the person on the other side is there to kill me, I answer it anyway. There is a GREATER chance the person there is checking to see if anyone is home before they kick down my door, so I'm here to let my presence known. There is a teenage boy at my door. He nervously smiles and extends a flier advertising his church's Easter egg hunt this Sunday. I'm sorry it had to be him, but it was. Instead of taking the flier and saying thanks, I explained we were Jewish and don't celebrate Easter. It's not like I told him to piss off, but it shocked him still. His hand remained extended with the flier, but he was unable to speak. I smiled and shut the door. He rejoined the group of teenagers knocking on doors. After, I felt a little bad about it. I probably scarred him for life. He'll never be able to enjoy Easter again. I think I had just hit my breaking point. I believe everyone has the right to believe or not believe in whatever they want. And you shouldn't be bothered about it. And you should be respectful. That is it. Even if, Mr. Yoy calls me a Libertarian. Anyway, thanks for letting me vent and I hope everyone has a wonderful holiday weekend, whatever you celebrate! And if you don't have anything to celebrate this weekend, just have an awesome weekend! I promise, I'll lighten things up in my next entry and blog about how insane the Yoys have been. Because they have. Do not disturb Mrs. Yoy. 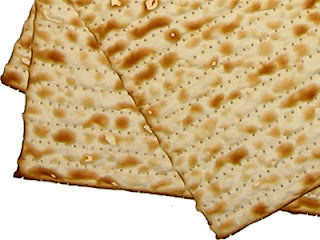 I'll be gorging myself with Matzo over the next eight days.